COLUMBUS, Ohio (AP) — President Donald Trump’s mission is to rally Republicans behind GOP candidates in the nation’s premier swing state. But when he steps into battleground Ohio on Friday, he’s entering a state — and a Republican Party — deeply divided by his presidency. The Republican president is set to offer the keynote address at a state GOP dinner, an annual fundraiser that traditionally features the region’s Republican royalty. Republican Gov. John Kasich, a fierce Trump critic and 2016 presidential primary opponent, won’t be there. A spokesman said the term-limited governor, who lives in a suburb of the city where the president is speaking, had a personal scheduling conflict. No state features an uglier public clash between Trump and a sitting Republican governor. And ahead of high-stakes elections for governor, Senate and several House races, the red-hot intraparty feud threatens to undermine the GOP’s chances come November — and could linger into the next presidential campaign. Trump’s chief Ohio lieutenant, Bob Paduchik, the president’s hand-picked Republican National Committee co-chairman, cast Kasich as “childish” and “insanely jealous” in an op-ed this month. In a subsequent interview ahead of Friday’s dinner, Paduchik repeatedly dismissed any suggestion that Ohio’s GOP is divided. Kasich, in a recent interview, said “people are getting sick and tired” of the partisan warfare coming out of the Trump White House. And he dismissed Trump’s popularity within the GOP as a byproduct of a shrinking party. “We’re dealing with a remnant of the Republican Party,” said Kasich, who has not ruled out challenging Trump in a 2020 presidential primary. As the feud burns deep, Ohio’s Republican candidate to succeed Kasich, Mike DeWine, is caught in the middle. DeWine, a former senator and the current state attorney general, has tried to use his role as one of Ohio’s longest-serving and best-known politicians to rise above the infighting and embrace endorsements by both Kasich and Trump. DeWine brought the entire Republican ticket onto the stage at his annual ice cream social in June and made light of the blistering Republican primary against Kasich’s lieutenant governor, Mary Taylor. Kasich was reluctant to endorse DeWine. He said for the first time that he’d support DeWine earlier this month only after securing assurances that the Republican candidate would preserve Kasich’s expansion of health care coverage for low-income residents as part of the Obama-era health care overhaul. Trump, like most of his party in Washington, has fought to dismantle the health care law. Polling suggests, however, that Kasich may be more popular than Trump in Ohio. A Quinnipiac University poll conducted in June found that 43 percent of Ohioans approved of Trump’s job performance, while 54 percent disapproved. In the same poll, 52 percent of state residents approved of Kasich’s performance and 36 percent disapproved. That’s created awkward moments for Republican candidates such as Jim Trakas, a former and aspiring state lawmaker, as they campaign in politically divided districts. Yet Republican strategists suggest that each Republican leader could be helpful this fall given Ohio’s cultural and socioeconomic diversity — particularly if voters don’t force them to choose. Kasich is especially popular in the suburbs where some of the most competitive House races will be fought. Trump remains popular among many white working-class voters in Ohio’s many cities, as well as with rural and Appalachian voters elsewhere. Yet there’s little sign the two are willing to work together. Each separately took credit for the GOP’s razor-thin lead in this month’s special congressional election in central Ohio and said the other should have just stayed out of it. The final tally, announced Friday, gave the win to Republican state Sen. Troy Balderson. Kasich told the AP that his decision to endorse Balderson in the race was essential to the win: “We sure needed me involved in the congressional race out here.” Trump, meanwhile, charged on Twitter that Kasich’s endorsement actually hurt Balderson by tamping down enthusiasm. Republican Sen. Rob Portman of Ohio told reporters this week that the party is unified behind its candidates heading into the fall. Portman said he was looking forward “to seeing a lot of friends from around the state” at Friday’s dinner. Peoples wrote from New York. Associated Press writer Dan Sewell in Cincinnati contributed to this report. CLEVELAND (AP) — The national retail chain Jo-Ann Fabric wants its customers to sign an online petition and send letters to members of Congress and to the White House urging exemptions from tariffs on hundreds of products the company imports from China. A company official said Thursday that without the exemptions, Jo-Ann customers would “immediately suffer the consequences of these goods being taxed” when the company is forced to raise prices. Amanda Hayes, a spokeswoman for the Hudson, Ohio-based retailer, said more than 20,000 people have signed the petition since it went online Monday. The biggest “hit” for the 25-percent tariffs, she said, would be fabrics, fleece and yarn the privately-held company sells online and at its 870 retail stores. “These are the components we sell in our stores that people purchase and make things that are made in America,” she said. Hayes estimated that around 20 percent of Jo-Ann’s customers are small business owners and charitable organizations that buy material from the company to create handmade products for sale. She added that if those entrepreneurs and charities are forced to raise prices on clothes, blankets, quilts and other items they produce that their customers might opt to buy less expensive imported goods not subject to tariffs imposed during the ongoing trade dispute between China and President Donald Trump’s administration. The U.S. lacks suppliers capable of providing the quantity and quality of the products Jo-Ann buys from China, Hayes said. She added that around two-thirds of the company’s products are sourced from China. And around 90 percent of what Jo-Ann sells is used by customers to create something, she said. Ed Weinstein, Jo-Ann’s vice president of tax and public affairs, was in Washington on Monday lobbying against the tariffs. He told The Associated Press he doesn’t understand how fleece and yarn have become part of a trade dispute over high-tech policy. Hayes said company president and CEO Jill Soltau was in Washington on Thursday meeting with U.S. trade representatives. Hayes said the company appreciates the intent of the tariffs and supports fair trade with China. “We’re not seeing this as a political issue, but as an unintended consequence of a well-intended effort,” Hayes said. WASHINGTON (AP) — President Donald Trump pressed Attorney General Jeff Sessions on Friday to investigate his perceived enemies, as the long-running feud between the men bled into another day. The president’s tweets marked the second day of a highly public smackdown by Trump of his attorney general — the latest in a dispute that has simmered since Sessions recused himself from overseeing the Russia investigation. Trump’s anger with Sessions boiled over in an interview with Fox News in which the president also expressed frustration with the plea agreement his onetime legal fixer Michael Cohen cut with prosecutors, implicating Trump in a crime that Cohen admitted. Trump said it might be better if “flipping” — cooperating with prosecutors in exchange for more favorable treatment— were illegal because people cooperating with the government “just make up lies” to get a break from prosecutors. But Sen. Lindsey Graham of South Carolina, who in March said firing Sessions would “blow up” the Judiciary Committee, has been shifting his tone. Associated Press writers Eric Tucker, Zeke Miller, Jonathan Lemire, Chad Day, Ken Thomas contributed to this report. NEW YORK (AP) — President Donald Trump’s finance chief, a close confidant who has worked for the family’s real estate business since the early 1970s, was granted immunity in the federal probe of former Trump lawyer Michael Cohen, media outlets reported Friday. Depending on the extent of the immunity granted to Trump Organization chief financial officer Allen Weisselberg, which was not immediately known, it could be a major development in the ongoing investigations surrounding the president. The 71-year-old Weisselberg is likely to have knowledge of every major personal and business deal Trump has been involved in since his career as a real estate mogul began. The Wall Street Journal and NBC News were the first to report on anonymous sources that Weisselberg got immunity to talk to federal prosecutors in the investigation of hush money Cohen paid to two women who claimed affairs with Trump. Cohen pleaded guilty to tax and campaign finance violations Tuesday. And while not named in the Cohen case, Weisselberg is believed to be one of two Trump executives mentioned in the suit who reimbursed Cohen and falsely recorded the payments as legal expenses. Weisselberg’s deal comes on the heels of several media reports Thursday that Trump’s longtime friend David Pecker, the CEO of National Enquirer publisher American Media Inc., had also been granted immunity in the Cohen probe, as well as the company’s chief content officer, Dylan Howard. What’s not clear is the extent of Weisselberg’s immunity, whether it was in exchange for his cooperation just on Cohen’s case, or if it extends to cooperation on other investigations. A spokeswoman for the Manhattan U.S. Attorney’s Office declined comment. The Trump Organization eventually reimbursed Cohen for that payment, setting up a sham invoices for legal expenses. The court filings, prosecutor say two unnamed Trump Organization employees — “executive 1” and “executive 2” — helped in making the payments. The “Trust” refers to the entity that Trump set up after the election to hold his assets. He put the trust in charge of his two sons and Weisselberg. 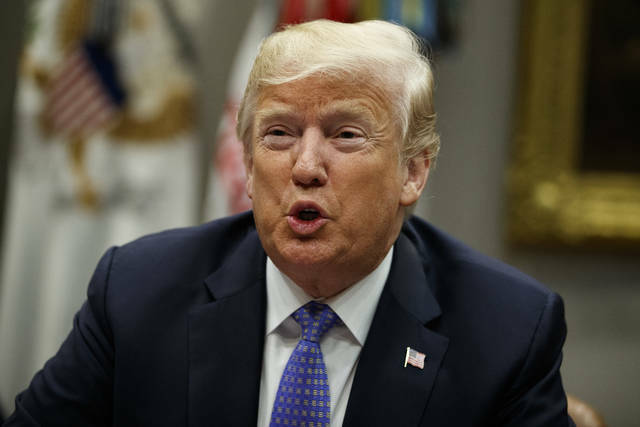 WASHINGTON (AP) — The Trump administration has laid down rules aimed at preventing residents in high-tax states from avoiding a new cap on widely popular state and local tax deductions. The action under the new Republican tax law pits the government against high-tax, heavily Democratic states in an election-year showdown. Mulvihill reported from Cherry Hill, New Jersey. Associated Press writer Michael Catalini in Trenton, New Jersey, contributed to this report. PROVIDENCE, R.I. (AP) — Some Rhode Island politicians are speaking out against a Trump administration plan that would allow schools to use federal funding to buy guns for teachers. Democratic Gov. Gina Raimondo says the plan being considered by Education Secretary Betsy DeVos is “ill-advised and dangerous,” adding that the funding would be better used on school supplies and professional development. The Providence Journal reports that the governor’s Republican opponent, Allan Fung, agreed, saying the funding should be used to help students in the classroom. Democratic gubernatorial challenger Matthew Brown called the idea absurd. Some Republican and independent politicians spoke out against arming teachers while remaining open to allowing former police officers or veterans to patrol schools. The Education Department is reviewing legislation to see if certain grants can be used to buy firearms. LAS VEGAS (AP) — An ex-felon and a woman accused of being his accomplice have been indicted on federal firearm theft charges after a pickup truck and trailer containing about 375 guns and ammunition was stolen from a Las Vegas-area casino parking lot. Court documents say the weapons belonged to a licensed firearms dealer attending a gun show. Samual Lane Donesing, 28, and Jaemillah Eagans, 26, pleaded not guilty Thursday during initial court appearances in Las Vegas, Interim U.S. Attorney Dayle Elieson said. Attorneys Kathryn Newman, representing Donesing, and Brian James Smith, representing Eagans, declined to comment. Henderson police and federal Bureau of Alcohol, Tobacco, Firearms and Explosives agents found the pickup and trailer in separate places in Las Vegas after the July 31 theft outside Fiesta Henderson. The cache of weapons, ammunition, holsters and magazines was found at a house in Las Vegas where Donesing and Eagans were arrested Aug. 1. Authorities also located a white Cadillac parked on a nearby street that had been seen on casino security video in connection with the theft, according to the indictment. It also said Donesing and Eagans were identified from player loyalty cards that they used in the casino in the hours before the truck and trailer were stolen. Each suspect could face up to 10 years in federal prison if convicted. Donesing also faces a charge of being a felon in possession of a firearm. He had four previous felony convictions in state court in Las Vegas on charges including forgery, auto theft, possession of a stolen vehicle and burglary. Donesing remained in federal custody pending a trial scheduled Oct. 15. Eagans was put on supervised release including drug treatment.